Petilil's official artwork from Pokémon Black and White. Petilil (チュリネ, Churine) is a creature from the Pokémon games. Petilil is a Grass-type Pokémon introduced in Generation V, where it can be found in the wild exclusively in Pokémon White and White 2: its Black/Black 2 counterpart is Cottonee. Petilil is categorized within the Pokédex at #548 as the "Bulb Pokémon". 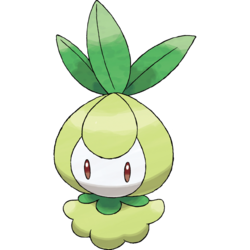 It is a female-only species, and it evolves into Lilligant when exposed to a Sun Stone. Sleep Powder is a Grass-type status move with 75% accuracy which puts its target to sleep if successful. Petilil learns it at level 10 in all games where it appears. A Petilil attacking Robin in Smash Run. Petilil appears as an enemy in Smash Run. It waddles around and occasionally stops to use Sleep Powder, spraying purple dust in front of it which puts asleep any player caught into it. Petilil trophy in for 3DS. This page was last edited on April 5, 2019, at 22:51.